seaweed shingles which overhang caves. the lint off their cushions. Monica Raymond is a poet and playwright, sometime essayist and photographer, general artist/teacher type, currently based in Cambridge, Massachusetts. Her play A to Z won the 2011 Ruby Lloyd Apsey Award for plays about race/ethnicity. She has now had work in 15 issues in a row of qarrtsiluni, which means that her work has passed muster with 15 different editorial teams—an unprecedented achievement. the wilds from which she came? together briefly, as by some force? not one captor and the other captive. Monica Raymond is a poet, playwright, sometime essayist and photographer, general artist/teacher type, currently based in Cambridge, Massachusetts. She’s published all of the above genres (except plays) in previous issues of qarrtsiluni. poor son, made monk where man had been? into a sack thrown in the Seine? Where are they, weird sober wren? why they ventured, where they’ve gone—. These are homophonic renditions. While they are ruled by the form and rhythms of the original, and to a certain extent by the content of the original as well, my choice of words is governed as much by sound as by sense. The first is of a widely translated poem by Francois Villon, “Ballade des dames du temps jadis,” the refrain of which is usually rendered as: “Where are the snows of yesteryear?” I have long wanted to do my own, slightly cockeyed, version, which qarrtsiluni’s call for submissions gave me impetus to attempt. The second poem I wrote about fifteen years ago while taking a course in the Provençal (Occitan) lyric in graduate school. I haven’t yet re-located the original of Aubade, though believe me, it has one — I could never have come up with those dizzying rhythms and surreal juxtapositions without a source! 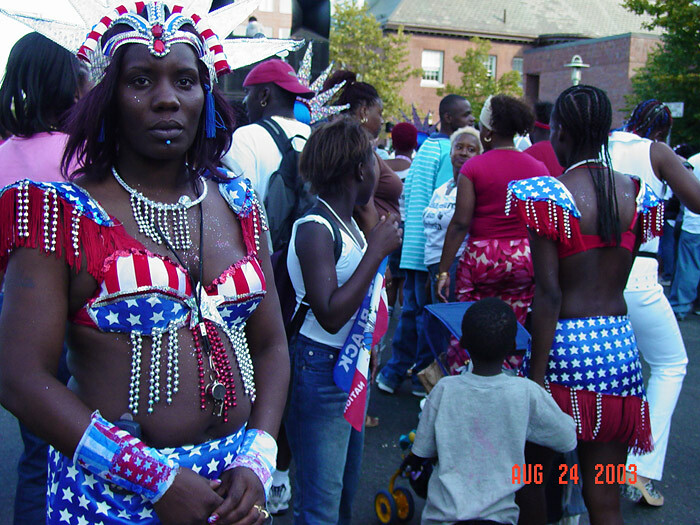 On Memorial Day of 2005, I took part in a performance conceived by Tom Plsek at the large open plaza in front of Boston City Hall. “Collateral Damage Noted” was to be a sound meditation on the civilians killed in the Iraq war. The latest reliable figures place this total at almost 25,000, he wrote in his call. Plsek’s idea was that musicians would stand in a circle and sound a note for perhaps ten or twelve seconds,then pause, averaging three to four long notes a minute. Each note was to represent the life and death of an Iraqi civilian. By his calculations, if a hundred musicians did this for an hour, we would have made enough notes to account for the Iraqi women, children, and non-combatant men killed till then. I had signed up to participate, even though I was not, strictly speaking, a musician. In fact, in the fourth grade, I had been asked to just move my lips during “Walking in a Winter Wonderland.” And more recently, the director of a play in which I was touring had barred me from a musical number — the history of Zionism set to the tune of Hava Nagila. Was I just out of my mind, someone who had never set foot on ground steeper than a parking lot signing on for Annapurna? No, because in that same play, I’d had a solo — improvised wailing as I hung up banners with the names of massacres. Mournful wailing — there aren’t a lot of calls for it these days, and I’d just been hitting my stride when the tour ended. So when I saw Tom’s call for volunteers — voice, okay, he’d said — I jumped at the chance. Plsek, a trombonist, had an elongated heron look, beaky nose, and eyes close-set behind pale glasses. Gradually, the musicians arrived. Most wore jeans, and looked well-worn and familiar, like travelers gathered in a hostel you’d met all your life in dreams. As we clustered in the center of the plaza, Tom read a quote from the Dalai Lama — basically that war is hell, and now that it’s automated, it’s even more hell. He wanted each note to be heartfelt, pure, beautiful, delivered with full attention, he said. After all, it was a human life. We spread out in a large circle. To my left was a man whose wide wooden flute with conspicuous nodes was, he explained, a shakuhachi. His skirt, his shirt, his glistening closecut hair, the flute itself, all were the faint brownish golden tones of bamboo. To my right was a tiny woman whose left arm was handless, ending at the elbow with a small curve, like a heel of French bread. She used it to support her instrument — a tiny trumpet with three stops. “A pocket trumpet,” she explained. Beyond her the musicians looked blurry and faint, as if seen across a chasm. Some listeners had settled onto blankets and towels at the center of the circle, as if the event were a beach party. Now Plsek moved to the center, and the rustle of chatting ceased. He gave the signal to begin — raising his hands above his head, and then lowering them with a sharp flap, like a giant bird. I began whooing away, counting the beats, Soon I became winded and breathless. Try as I could to make them even, each note seemed to come out differently. I thought of who they might have been — a short “ha” that ended unexpectedly quickly a five year old boy, the echoing ululation his mother, croak of a grandmother. Tom walked around the circle holding a placard — we were a quarter of the way through. Across the concrete, I saw my old housemate Jen Bliss, with her Renaissance princess look, blowing her flute. Halfway round was Katt, small and compact, cap of dark hair bent over her violin. Sonorities of accordions, tiny Tibetan gongs — their concentric resonance filled the air. I closed my eyes and went back to sounding. Now my breath lengthened. The sounds came out as “oh”s, keening and sorrowful. Sometimes the lives I signified were briefly real to me, the complex muscular length of a human body, a ghost image of a family sitting around a table, a father carrying his son on his back. Sometimes I threw my lot in with the shakuhachi, joining its cavernous unearthly tones. Other times I was just a machine for pumping sound, feeling underwater somehow, a whale or dolphin hooting through my blowhole. I knew I was loud — I hoped not too loud. I opened my eyes to find Bob Raymond (no relation) staring back at me from inside the circle with his video camera. I guessed he had just shot footage of me, hair sticking up, eyes closed and diaphragm heaving. I felt stupid for not having realized this would be videotaped — Mobius Artists Group, of which Plsek is a member, documents everything. Behind Bob came Plsek with a placard — and I was surprised to learn that we had only ten minutes left to go. Rapt in the trance of my own sound, I’d somehow missed the midpoint. These last notes came hardscrabble, fast and furious, like clambering up to the top of a small mountain. Eyes open now, I can see members of our circle blowing, bowing, gonging, chiming, as we try for the last few moments to embody the crowd of the faceless dead. Plsek takes the center of the circle, and draws his arms down. Silence. For a second, it’s as if we have launched a huge invisible egg into the cosmos — we stand and watch it rise. Then disheveled and somehow humble, like participants at a meditation retreat or a funeral, we mill about, touching each other’s instruments, The circle becomes fractal, like a coast full of inlets and crenellations, finally dispersing completely as we cross over to those we’ve recognized on the far side. Monica Raymond won the Castillo Prize in political theater for her play The Owl Girl, which is about two families in an unnamed Middle Eastern country who both have keys to the same house. She was a Jerome Fellow for 2008-09 at the Playwrights’ Center in Minneapolis, among many other honors and awards. “Dreaming the World” was a prize-winner this fall in Caffeine Theater’s “Old Father William” Contest for poems influenced by Lewis Carroll. Click on image to view a larger version. 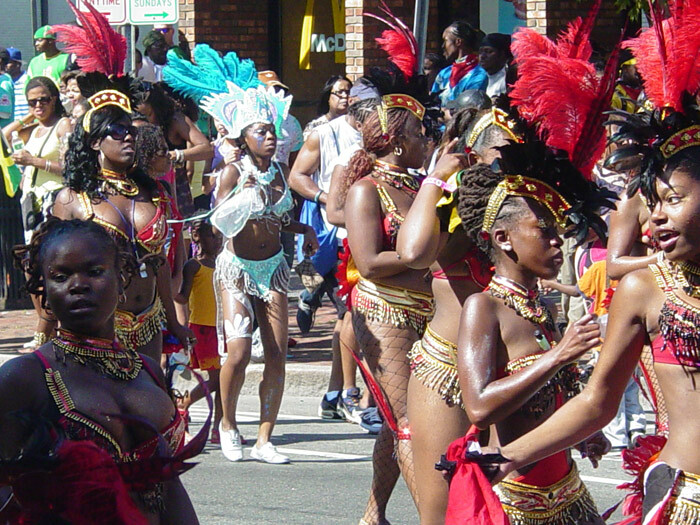 Cambridge Carnival. Central Square, Cambridge, Massachusetts. August 2003. Monica Raymond won the Castillo Prize in political theater for her play The Owl Girl, which is about two families in an unnamed Middle Eastern country who both have keys to the same house. She was a Jerome Fellow for 2008-09 at the Playwrights’ Center in Minneapolis, among many other honors and awards. Her poetry has been published in the Colorado Review, the Iowa Review, and the Village Voice. though pinching at odd moments. Regan’s a pale poufy blond who talks kind, leaves you tired. lines you might invent for an absent man. Monica Raymond won the Castillo Prize in political theater for her play The Owl Girl, which is about two families in an unnamed Middle Eastern country who both have keys to the same house. She was a Jerome Fellow for 2008-09 at the Playwrights’ Center in Minneapolis, among many other honors and awards. Her poetry has been published in the Colorado Review, the Iowa Review, and the Village Voice, and her work has been selected for publication by every pair of qarrtsiluni editors for eleven issues in a row now.